Valletta 2018 Chairman Jason Micallef opening the Valletta 2018 Conference Living Cities, Liveable Spaces. 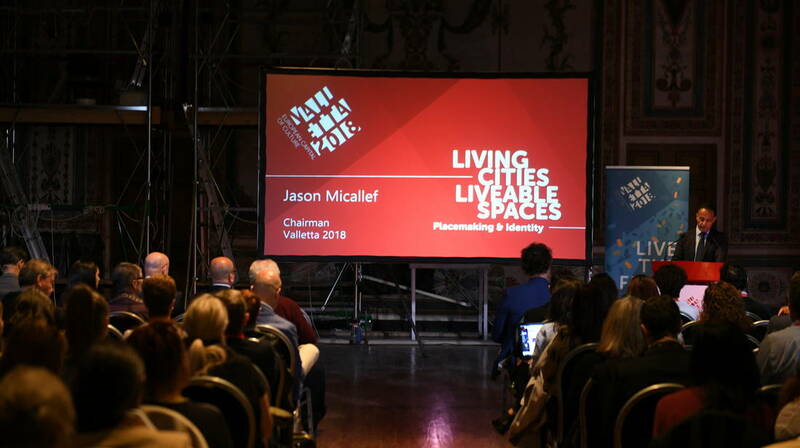 The Valletta 2018 conference Living Cities, Liveable Spaces: Placemaking & Identity was opened earlier today by Valletta 2018 Chairman Jason Micallef and Parliamentary Secretary for Consumer Protection and Valletta 2018 Deo Debattista at the Gran Salon at National Museum of Archaeology. The conference focuses on the themes of urban development, community engagement and well-being, as well as cultural diplomacy, particularly in light of large-scale activities, such as the European Capital of Culture and other public events. “I personally dream of the day when we will measure the success of a city not by economic markers but by the overall happiness of its citizens,” added Micallef. Conference keynote speakers include Prof. Dr Sebastian Olma, a leading critical and design theorist and author of “In Defence of Serendipity: For a Radical Politics of Innovation”. The conference will also be addressed amongst others by Jaakko Blomberg, a Finland-based urban activist, Dr Tricia Austin, a design consultant and academic at Central Saint Martins, Dr Marie Briguglio, academic and economist at the Malta University of Malta and Bjorn Vassallo, the Director for European Member Association at FIFA. The conference will also feature a series of parallel sessions, allowing researchers from across the globe to explore the phenomenon of place branding and community well-being. The conference runs till the 24th November.